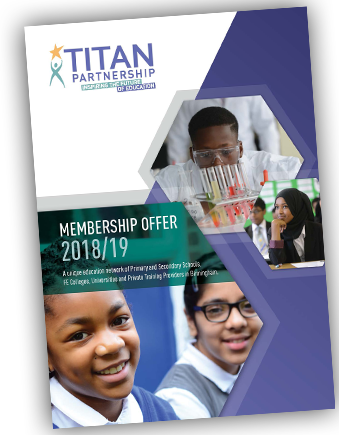 The Titan Partnership is a unique cross-phase network of Nursery, Primary and Secondary Schools, FE Colleges, Private Training Providers and Universities in Birmingham. With a focus on inclusion, collaboration, skills and employability we are helping our young people to create opportunity, gain meaningful and sustainable employment and to generate prosperity for themselves, their families, their communities and for local businesses and, through our specialist Initial Teacher Training Programme we are developing the teachers and leaders of tomorrow. Working with employers and community partners we are transforming young lives by unlocking potential, raising aspiration and developing the skills for success. The Titan Partnership is driven entirely by the needs of our members. We facilitate and enable leaders, managers, teachers and business support staff to collaborate in order to share best and next practice whilst also providing a wide range of activities for children and young people to learn and practice the skills they need for the world of work. 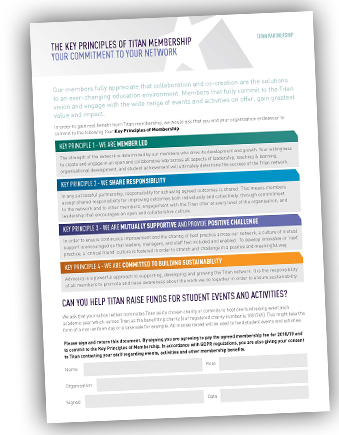 Truly collaborative in our approach, members work together to provide a focused programme of events and activities for students as well as exclusive CPD and networking opportunities for staff to share best and next practice. In everything we do Titan aims to provide exceptional value for money and benefit for our members.